The Foggy Bottom Morris Men in the 2007 Elizabethan Revels. Jim has danced Morris with Washington Revels since its first Christmas Revels show in 1983. Jack Langstaff, who founded Revels, and Mary Swope, founder of the Revels Company in DC, walked toward us across the National Mall. It was a beautiful, sunny Spring day in 1983. The Foggy Bottom Morris Men were dancing in front of the Castle, near the carousel. Jack and Mary watched carefully. We talked. They needed a Morris team for a show they were doing at Lisner Auditorium that December — the very first Christmas Revels in Washington. Would we be interested? Jack and Mary saw us do dances from villages in the Cotswolds area of England, near Oxford. Like most Cotswolds teams, we wore bells, waved handkerchiefs, and clashed sticks. Morris dancing includes a variety of styles; that was just one. Northwest teams dance in steel clogs down city streets. Molly dancers step hop, hands closed, moving their arms sharply up and down. Border dancers can seem wild with sticks, bells, painted faces, and strong rhythmic stepping. Sword dances, with rappers or longswords, can be considered Morris. 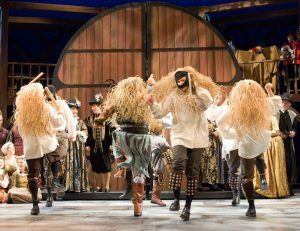 An extended definition would even include the Abbots Bromley Horn Dance, featured in many Christmas Revels shows. 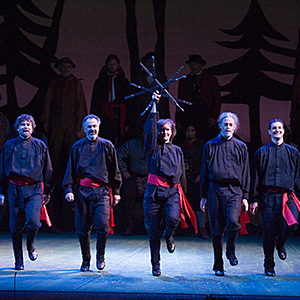 Cutting Edge performs a sword dance in the 2008 Québécois Revels. No one knows how old these dances are. The village of Abbots Bromley says the Horn Dance was done in 1226. Rapper sword is much newer, depending, as it does, on technology for making metal so flexible as to make pretzel dough seem stiff. Shakespeare refers to Morris dancing in several plays, early and late; Will Kemp performed his Nine Days Wonder — dancing the Morris from London to Norwich — in 1600. The name itself seems to come from ‘Moorish,’ but it is quite possible that the dancing was around in some fashion before Moors could influence English dance. The dances almost died out. They might have, indeed, had a gentleman named Cecil Sharp not looked out his window in Headington on Boxing Day 1899. The quarry men who made up the team were short on money that Winter and wanted to pass the hat. In Sharp, they found an eager audience. The revival began; the number of teams grew. The dance even crossed the ocean to North America. In the 1930s Jack Langstaff learned Morris dancing from Douglas Kennedy, a disciple of Sharp and a central figure in English dance and song in his own right. Jack added it to the wealth of traditions that he collected and came to include in The Christmas Revels. They were a part of the first shows he put in the 1950s and an essential part of the Revels that we know when they started in Cambridge two decades later. Rock Creek dances the Morris in its usual outdoor setting. Photo by Arthur Stephens. On that Spring day, Jack and Mary had little trouble convincing Foggy Bottom to be a part of the first Christmas Revels. We danced longsword, the Horn Dance, and the Lord of the Dance then and in many shows after. 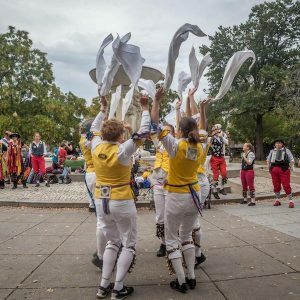 Revelers will also remember Cutting Edge and the Rock Creek Morris Women, who have appeared on the Lisner stage more than once before this year. What about the women? It was long thought by many that Morris dancing was only for men. Few recognized that women continued the tradition when men went off to die in Flanders in World War I. Or that Mary Neal was a central figure in the early revival. But Morris is a living tradition; attitudes have changed markedly in the years I have danced. In Washington women have danced Abbots Bromley since 2007 and Lord of the Dance since 2016. This year, the audience in Lisner will have the privilege of seeing the Rock Creek Morris Women, one of the premier teams in the country. Enjoy them this year as they carry on this ageless tradition. I think Jack might approve.